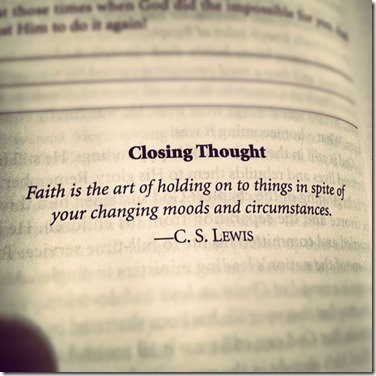 What’s driving you…faith or feelings? Do you get easily discouraged by things people say and do? Do you find yourself withdrawing from activities when you don’t feel appreciated? Do you get upset when you feel God isn’t answering your prayers quick enough? Every follower of Christ will be faced with situations on a daily basis that may cause them to feel something that makes them uncomfortable. What you choose to do or how you choose to respond tells a lot about your walk with Christ. Are you finding yourself combating those negative feelings with the truth of God’s Word or do you cave in and succumb to them? Our spiritual maturity can be measured by what we allow to control us. If our feelings are driving us then we are likely to find ourselves in a constant state of unrest. Christ promised us peace. If His promise is true than why do so many struggle with fear, anger, bitterness, jealousy, rage etc? 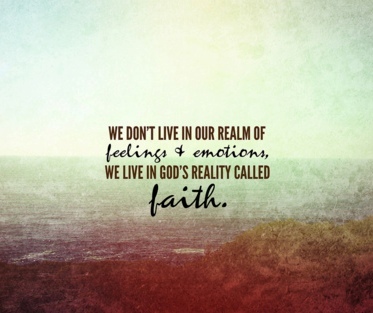 It is because we are putting our feelings before our faith. When we do this we allow them to control our behavior. The Word of God says in Hebrews 10:38 NKJV 38 Now the just shall live by faith; But if anyone draws back, My soul has no pleasure in him.” We cannot please God when we choose to live by “feelings,” only when we live by faith. Faith is trusting in His Word and in Christ to fulfill His word in our lives. When we live by feelings and draw back from our faith, He is not able to reach us through His word. Instead we are choosing to believe in what we see and feel! The best way I have found to counter living my life by my feelings, is to interject scripture verses into my situation. When I find myself in a new situation that would typically cause me a lot of discomfort I remind myself that I can do all things through Christ who strengthens me! Phillipians 4:13 NKJV. If I am struggling with bitterness towards another that I believe to have offended me I can give in to those feelings and act accordingly by allowing it to take root in my heart or I can choose to believe what the word of God says in Hebrews 12:14-17 NKJV14 Pursue peace with all people, and holiness, without which no one will see the Lord: 15 looking carefully lest anyone fall short of the grace of God; lest any root of bitterness springing up cause trouble, and by this many become defiled; 16 lest there be any fornicator or profane person like Esau, who for one morsel of food sold his birthright. 17 For you know that afterward, when he wanted to inherit the blessing, he was rejected, for he found no place for repentance, though he sought it diligently with tears. When I realize that the word of God has a powerful warning like this against allowing a bitter root to spring up in me, I am not willing to become enslaved by bitterness. If I find myself in a situation that causes me to be afraid I can choose to cave into that fear and thereby shut out hearing God’s voice or I can lean into Christ and remind myself of 2 Timothy 7-12 NKJV where I am told, 7 For God has not given us a spirit of fear, but of power and of love and of a sound mind.8 Therefore do not be ashamed of the testimony of our Lord, nor of me His prisoner, but share with me in the sufferings for the gospel according to the power of God, 9 who has saved us and called us with a holy calling, not according to our works, but according to His own purpose and grace which was given to us in Christ Jesus before time began, 10 but has now been revealed by the appearing of our Savior Jesus Christ, who has abolished death and brought life and immortality to light through the gospel, 11 to which I was appointed a preacher, an apostle, and a teacher of the Gentiles.12 For this reason I also suffer these things; nevertheless I am not ashamed, for I know whom I have believed and am persuaded that He is able to keep what I have committed to Him until that Day. Do you realize that if everyone since the time of Christ had lived by their feelings, the gospel would NEVER have been shared? Men and women would have caved at the first sign of rejection or persecution! You and I would still be lost. God has given us feelings and they can be wonderful but if you base decisions on feelings alone you may soon find yourself outside of God’s plan for your life. Several years ago, I met a married mother of two who had recently become a Christian. Her marriage was going through a difficult patch. She told me that one day she was down by the pond where she sat watching a family of ducks swim. She watched as the mother duck left the side of the male duck and began to swim beside another male. Her ducklings soon followed. This woman determined that God was trying to tell her, through the ducks, that she was to leave her husband and find another. That God wanted her to be happy with a new man… I tried to explain to her that God hates divorce. Unless she was in danger or her husband was unfaithful to her, God would not want her to leave her husband. She said HE wouldn’t have given her the sign and the feelings she was feeling if it weren’t true…. Though it now seems a little ridiculous that someone would base their future on ducks on a pond, some Christians still make important decision based on their feelings and not the truth of God’s word. Most areas in our lives that we find ourselves defeated or discouraged are usually areas that we are still living through our feelings. Moving past our feelings is vital as a follower of Christ! We all must learn to walk out our walk by faith. To do so requires spending time learning the scriptures. When a thought first comes to us we are to take that thought captive. Is it truth? Does it line up with the word of God? If not dismiss it before it begins to affect your feelings or behavior in a negative way. We have been given truth and the truth will not only make us free but keep us free when we choose it! ← Is it time YOU lightened up the darkness?